No one likes spending hours in excel sheets to get forecasting done. 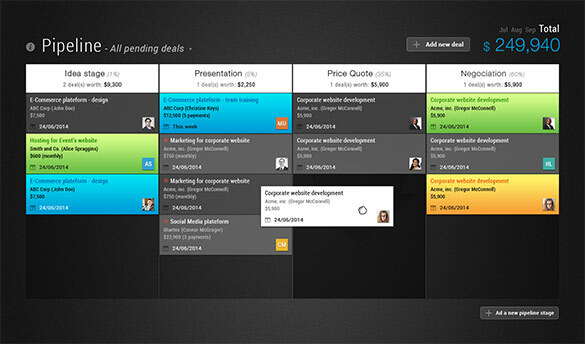 Updating the pipeline status of a deal is now reduced from 15 to 20 clicks and steps to just a simple drag and drop. UPilot's Visual pipeline gives you the ability to see Instantly which deals are progressing and take immediate action to close more deals. UPilot's proven high adoption by Sales people means that actual data gets captured in real-time. As a result, you get accurate insights to drive your sales strategy. UPilot provides key preconfigured dials where you can track cash flow projections and revenue projections and can handle recurring revenues and multiple milestone based payments too. Figure out what is working in the moment and how to improve it even more. All sales reports are auto generated in real time, with a drill down to raw data. No more spending hours generating sales reports in excel sheets. Get complete control on how you want your dashboard and focus on what's important for you. Compare what's working, and how your business is growing with simple customizable dials designed to save you time. An insight is of no use if it cannot be verified by getting to the raw data that led to that conclusion. Simply click on the title of a chart or dial and you have instant access to the data behind it. With the UPilot Radar, you'll always know what's going on in your team and spot danger before it gets too close. With the ability to track each salesperson's activity, the Radar helps you decide what to focus on and where you best spend your time. UPilot let's you customise your fields, so you don't need to change your workflow to fit your CRM. 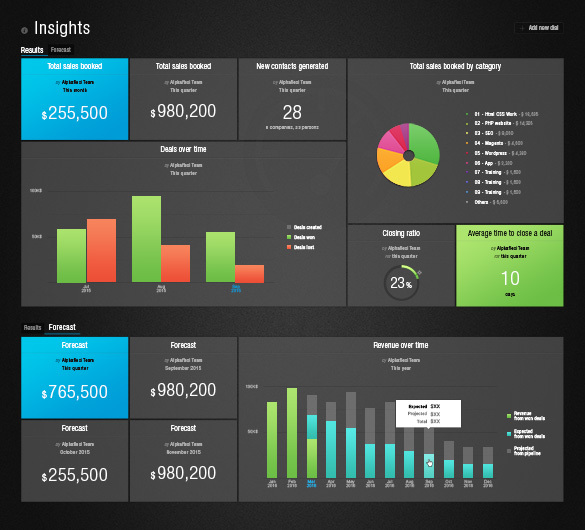 Create the dashboards and reports to help you focus on what's important for you. Support staff needs to see the customer data but not the sales commission figures - manage who sees what in 3 clicks. Increase close rate by 20 to 40% using our unique approach to ensure that no deal is lost because of a lack of follow up. You no longer need to BCC every Email that you send to your prospect! 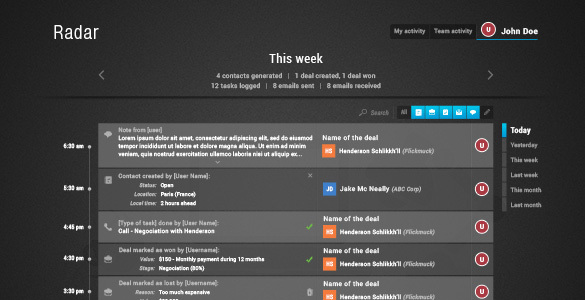 All your Email conversations are automatically linked to your contacts in UPilot. With a single click, you get to decide who can see your emails! Else, have just a single email you're not ready to share yet? Simply mark it as private, and it's done. With UPilot assist, save over 20 hours per month per salesperson by no longer needing to look for and manually add information. Just add the email address and UPilot takes care of the rest. Find the contacts details of any Company or Person including all social media information with just an Email address!